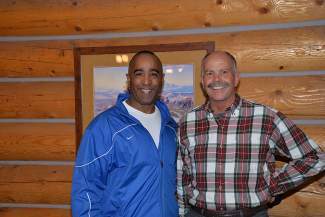 Republican vice chair Derrick Wilburn and Summit County Republicans chairman Kim McGahey shared initiatives for the party at the Silverthorne Elks Lodge on Friday, May 29. The Colorado State Republican Party’s vice chairman spoke at the Elks Lodge on Friday, the first time a GOP state affiliate has visited Summit in two years. The newly-elected Derrick Wilburn shared strategies for revitalizing the party by reaching a broader group of voters that evening. Wilburn’s platform to better engage with minority voters across the state earned him his position of vice chairman in March. Before that, Wilburn’s first foray into politics was holding a meet-and-greet at his Colorado Springs home to help garner support for U.S. Rep. Ken Buck’s campaign. Since then, he has moved forward to found Rocky Mountain Black Conservatives, among other organizations, and created a five-point plan for minority inclusion. “What do we do about it?” he asked the group of Summit County Republicans. Wilburn’s concerns are relevant, not just on the state level, but also the national level. A July 2013 study by the Pew Research Center shows that younger Republicans believe nominating more minorities would help with national elections. Sixty-eight percent of Republicans ages 18-39 agreed with this statement, compared with 49 percent of Republicans ages 40 and up. Wilburn encouraged local leaders to focus on getting involved in their communities, helping at schools and churches and going to events to build relationships before hunting for votes. Another Pew Report, conducted in April, shows the amount of work Republicans have before them. According to the survey, Democrats hold a significant advantage in the percentage of minorities that identify with the party, including 80 percent of African Americans (compared with 11 percent who identified as Republicans), 65 percent of Asian Americans (compared with 23 percent) and 56 percent of Hispanics (compared with 26 percent). Meanwhile, Republicans hold an advantage among Caucasians, with 49 percent identifying as Republicans, compared with 40 percent who identify as Democrats. Within Summit, both parties battle low participation and voter turnout. As of April 2015, 28 percent of the county’s voters were inactive, meaning they had not participated in the last even-year election or responded to notifications to update their status. Voters in the area are primarily registered as independent, at nearly 8,000 strong. The Colorado Secretary of State reports that Democrats slightly outnumber Republicans in the county, at 5,147 versus 4,305, but McGahey said independents in the area tend to swing left. The group is meeting this week to discuss strategies to reach out to minority voters in the county. They hope to bring Wilburn to Summit again for Frisco’s annual BBQ Challenge in June.